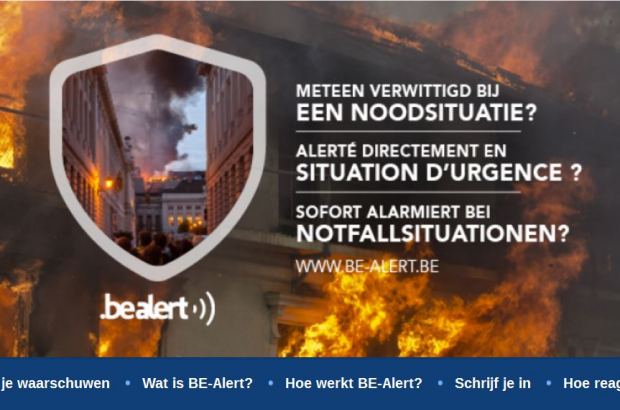 The efficiency of the federal emergency alert system BE-Alert was called into question at the weekend after a fire broke out in a container full of lithium batteries in Drogenbos, on the border of southwest Brussels. The system is used by five of Brussels’ 19 municipalities to automatically send a text message to residents in an emergency situation. The fire emitted toxic smoke, and an automatic message was sent to residents in Drogenbos, Forest, Uccle and Anderlecht to keep their doors and windows shut and turn off ventilation systems. There was more than 2.5 hours, however, between the time that the fire broke out and the text. The Dutch-language version was also received 20 minutes later than the French version, with some recipients taking to social media to complain that if evacuations had been required, for instance, those minutes would be crucial. Individuals can sign up for BE-Alert if they live outside the municipalities that sent alerts out automatically. Municipalities can also choose to send a message to every mobile phone in the vicinity of an emergency, whether or not that phone is signed up to the system.